Special offer price! £120 off RRP! Whether you select assembly, or you choose to assemble the shed yourself, a level, firm surface will be required. Please see details at the bottom of this page. The unit bolts to the ground and provides a tough, secure store that will genuinely deter thieves, made of 18 gauge steel. The ideal solution for securely storing your bike. May Reduce Insurance: certified by the Loss Prevention Certification Board to LPS 1175 Security Rating 1. Many accessories available with this shed. Simply screw into the Asgard steel storage unit for hanging items. Pack of 10. Sold Secure Silver ground anchor with 1.5m chain suitable for bikes and motorbikes. Tough, durable Orient Board flooring for the Annexe shed. Single flat shelf, can be fitted to back panel of Annexe units. Full width shelf. Single flat shelf, can be fitted to back panel of Annexe units. Half width shelf. Please note - all non-metric measurements are approximate. 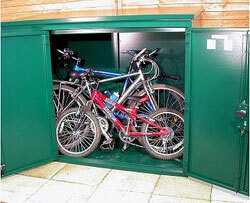 Benefits Of the Asgard Annexe metal bike shed 6x3 ? The shed doors and shed door surrounds are reinforced with 1.6mm thick steel box sections to strengthen the normal forced entry points and resist crow bar entry. All joints are double folded to increase strength and the base plinth is reinforced to prevent crushing when heavy objects are rolled over. The trap side is then bolted with 10mm steel bolts for additional security. Please note that before assembly can take place a level, firm surface will be required: you may already have this available (e.g. concrete, tarmac, patio), but if not, laying concrete or slabs about 50mm/2” thick before assembly would be ideal.